My decision to withdraw from the oil scene, of which I have been part for well over sixty years, provides the opportunity to review the basic points of the theory which I formulated in my first book - Essentials of Petroleum - published some forty years ago. While I am at it, I should endeavor to scrutinize the degree to which these findings have retained some validity - if any. Oil prices have fluctuated widely over the past few years. Today (4 July 1988) the price of North Sea Brent is less than US $14 per barrel, compared with OPEC's reference price of $18/bbl, which is based on a basket of seven crudes. This means that the price of Brent is nearly $5/bbl lower than the official selling price, if we take Nigerian Bonny Light (one of the seven crudes) as being equivalent to Brent. This is well below the average price of 1987, when OPEC was able to stabilize the market at around the targeted $18/bbl. Nevertheless, it is much higher than the price in 1986, when prices crashed below $10/bbl - and yet less than half the prevailing price in 1985. Thus, the fluctuations are very wide; much wider than anyone in the oil industry expected before 1985. The Mideast oil-producing nations are the heirs of the multi-national oil companies whom they gradually expropriated, starting around 1950. They have inherited the companies' problem: repressing investment and production. This paper looks at the pricing of petroleum products in Latin America and compares the policies adopted in countries with different endowments and with different traditions as to state involvement in the oil industry. I find that, in contrast to the OECD countries, product prices are used extensively as instruments of policy and that in general the more oil a country has the lower are its domestic prices. They also tend to be lower in the presence of state monopolies. This study examines the interdependencies of the dividend, investment, liquidity, and financing decisions of public utility firms during the 1974-1979 period and develops a multiple-criteria financial planning model of a public utility firm. The evidence on the perfect markets hypothesis that the dividend, investment, and new debt decisions of firms are interdependent is mixed. The perfect markets hypothesis is tested using a sample of public utility firms because utility firms pay very high dividends (relative to stock prices) and engage in large capital expenditures (relative to assets) compared with manufacturing firms. This paper constructs a model of firms' behavior before and after the introduction of time-of-use (TOU) pricing of electricity, encompassing optimal behavior under both flat-rate and time-of-use pricing. The model aims to be consistent, constraining those parameters not affected by time-of-use pricing so that they are the same under both price schemes. However, it also accounts for the new conditions (structure) under which the firm must operate once time-of-use pricing is adopted. The results show that the optimal capital under the flat rate is identical to that under revenue-neutral TOU. Almost all the firm's adjustments take place at the time that the time-of-use pricing is introduced, and only very few additional adjustments take place in the long run. These results contradict the widely-held belief that the firm cannot redistribute its electricity use over the day very quickly but can do so in the long run, once the capital input has adjusted to the new conditions. Projections of the future demand for electricitypublished annually since 1974 by the North American Electric Reliability Council (NERC) have proved in retrospect to have been too high and the projected growth rate has been revised downward each year. Should forecasters have been able to do a better job of predicting the slowdown in electricity growth which has occurred since the early 1970s? The authors have attempted to provide partial answers to this question by comparing the published NERC projections with benchmark forecasts provided by simple models representing well-established techniques. The authors also discuss how modelers and planners can cope with uncertainty by using the techniques of decision analysis. Our paper considers three policies in the design of offshore oil and gas lease sales that will help promote an economically efficient program of energy exploration and development on the Outer Continental Shelf. The first policy, having the government select when specific tracts should be offered for lease, involves extensive data requirements and is not practical. 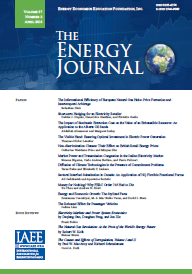 The other two policies--setting the royalty rate and stipu-lating a minimum bid level--require far less data and probably promote economic efficiency more effectively- The paper develops a method for calculating the economically efficient royalty rate and minimum bid level given the existing institutional structure of the U.S. offshore leasing program. A case study of the Gulf of Mexico demonstrates the approach. Taiwan lacks a natural energy endowment. Its energy demands have dramatically increased with the growth of the economy and standard of living during the past two decades. Based on the new socioeconomic developmentpolicy for the next two decades, the government of Taiwan has devoted special attention and effort to improving various social and environmental problems affecting the country's overall quality of life. The increasing rate of household energy demand will slow down as the market for electrical appliances reaches a saturation point and as the energy efficiency of appliances is improved. Transportation policies call for energy conservation during the next two decades by raising energy use efficiency. The industrial sector has also implemented energy conservation measures by raising energy efficiency and by diagnosing and improving energy-use. The logarithmic flow models generate elasticity estimates for prices that generally exceed estimates of recent studies both for the short run and the long run. This holds true over gasoline, diesel, and total motorfuel models. The linear gasoline results for price elasticity are in the range of previous estimates. In the logarithmic stock flow models, estimates of gasoline price elasticity exceed both short- and long-run estimates of previous studies. The liner stock flow model generates a price elasticity that is no different than zero (statistically) and an income elasticity that appears to be large in the short-ran. Nigeria, a member of the Organization of Petroleum Exporting Countries (OPEC), is blessed with relatively abundant energy resources like petroleum, gas, coal, solar, hydropower, etc. With an estimated population of 80 million, the country also has abundant human resources. In spite of her varied human and energy resources, the performance of the Nigerian economy has been closely linked with one resource, petroleum, a situation characteristic of most OPEC member countries. Recent changes in reserves or reserve/production ratios are often cited as evidence of hypothesized economic changes in petroleum markets. However, the technology of petroleum production and the fact that international petroleum markets are not perfectly competitive combine to render incorrect interpretations all too easy. Both market imperfections and technical limitations to production rates slow market adjustments to changes in expected prices or costs. This makes it difficult to use observed changes in reserve/production ratios as evidence of some hypothesized economic change, since neither of the observations used to get the observed change may have been close to the then-prevailing long run equilibrium. In a recent article in thisjournal, Charles Tiplitz (1986) presented estimates of the cost-minimizing level of seasonal distillate fuel oil inventories in the US primary sector. The costs he considered are for storage and the extra cost of operating refineries at extreme distillate yield. The "effect of price expectations" on seasonal inventories is deliberately excluded from the analysis.The Tiplitz study has interesting and useful results. However, it raises (without answering) the question of how cost-minimizing stocks differ from stocks held for price reasons. Some readers may conclude that price-responsive stocks are somehow different from or additional to cost-minimizing stocks.This interpretation runs counter to economic intuition. n the classic theory of the firm, the profit-maximizing plan for variable inputs also minimizes the variable cost of the most profitable output level. When there is an opportunity to store, supply can be accomplished through storage as well as input processing. Stocks are a variable input in the supply process. If producers are expected-profit maximizers, they should therefore manage stocks like other inputs to minimize the expected variable cost of supply.